Dressed in his full-length overalls, Icelandic fisherman Asgeir leads my guide and me to the edge of the harbor where several shipping containers rest ominously far from the rusted whaling boats tied to the wharf. Asgeir peers back at us with a delighted grin and utters something jokingly in Icelandic. My guide translates. “He says he has to keep the shark away from the rest of the boats so they don’t complain about the smell.” Worryingly, I don’t think he’s kidding. The object of my anxiety is hákarl, the Icelandic national dish of cured, rotten shark, whose putrid smell is said to rival its horrifying taste. When explaining hákarl to foreigners, Icelanders enjoy recounting the reaction of Anthony Bourdain who described the delicacy as “the single worst, most disgusting and terrible tasting thing.” Andrew Zimmern had a similar reaction, and even more disturbing, the smack-talking Gordon Ramsey reportedly vomited after eating it. Obviously, hákarl must be an acquired taste. Many native Icelanders, including my guide, adore it. Some despise it. But, undeniably, the food is an object of pride for the small Icelandic population of around 300,000 people. Before unfastening the steel container, Asgeir pauses dramatically, clearly excited to present what is his meticulously cultured hobby. The door swings open, sunlight penetrates the darkened space, and the chunks of meat are illuminated; suspended like giant cocoons. Shockingly, the shark does not actually smell upon first inspection, the odor blessedly protected by its dry and rigid skin. Only when the hide is cut away to reveal the rotten flesh does the rancid stench waft through the air, singeing the nostrils and back of throat. Hákarl is made specifically from a Greenland shark that lives in the polar waters of the North Atlantic Ocean. It has thick, spiked scales and can grow as large as 24 feet in length. Like all cartilaginous fishes, its meat seeps with ammonia-rich urea, a compound also found in, yes, urine. It is poisonous when eaten fresh, having the potential to cause illness and possibly death to those who ingest it prematurely –hence the requirement for intentional rotting. 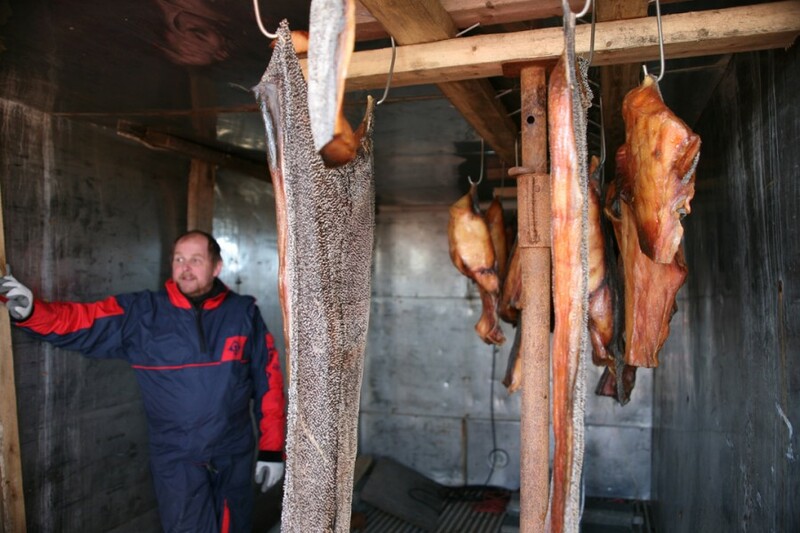 Burying the shark in the ground is the traditional Viking method for curing hákarl, but Asgeir prefers the modern approach, which entails curing it first in a plastic box and then hanging strips of the meat on rafters inside the shipping container, allowing it to decompose for 20 weeks. “Only in fall, winter and early spring,” he notes. “The flies go after it in the summer.” Respectfully noted. So what does hákarl taste like? Some say the flavor is similar to the taste of broken dreams. But seriously, the hype is larger than the truth. Yes, it was a struggle to keep the shark down in the presence of fiercely nationalistic Icelanders, but when I tried it, the hákarl was actually somewhat sweet and initially there isn’t much taste . . . it’s the aftertaste that lingers pungently. Certainly, hákarl is an element in Icelandic history, and whether it bestows a pleasing or foul flavor for its citizens is beside the point. But taste is really not the important issue. 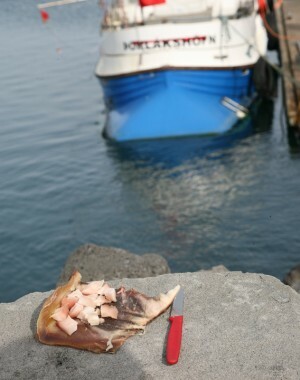 Rather, hákarl is a conduit to a past where the rotten Greenland shark was the only meat that could endure a sunless winter; a time when the country had so few residents that they literally depended on their inventiveness and resilience to survive — a resourceful type of endurance. Hákarl is more than a food. It is more than novelty. It is more than a delicacy. Purely, it is a bond to a millennia-old culture that still beats steady in the hearts of all Icelanders. Jenna Blumenfeld, (Jenna Ogden Blumenfeld when she’s in really big trouble) hails from the wee state of Connecticut. Although her childhood dream of becoming a bug doctor — with a specialization in ladybugs — has gone unfulfilled, she is content writing about travel, cuisine and culture. A vegetarian, she currently resides in the food hub of Boulder, Colorado. Read more of her food-centric writing at NewHope360.com.